Congress on curbing food marketing to kids: not a chance. Congress asked the FTC to examine the effects of food marketing to children and make recommendations. The FTC, USDA, FDA, and CDC got together and produced a report recommending voluntary guidelines for marketing to children based on the nutritional quality of the foods. I thought the guidelines were weak in addition to being voluntary (they allowed lots of junk foods to qualify). The food industry disagreed, strongly, and went to Congress to object. Congress caved in to industry pressure and said the report could not be released unless the FTC produced a cost-benefit analysis. Why Congress feels that it’s necessary to do this again is beyond me. I suppose we should be glad our legislators are at least doing something. As for the food industry’s role in all this: when food companies say they are doing everything they can to reduce marketing junk foods to kids, you now know what they really mean. The Federal Trade Commission (FTC) just ruled that POM Wonderful’s claims for the health benefits of its pomegranate juices and products are indeed deceptive. The FTC also said POM cannot claim that its products do anything special for heart disease, prostate cancer, and erectile dysfunction—unless it produces convincing evidence for these claims through two randomized, controlled clinical trials. The dispute over POM’s health claims has gone on for more than two years. 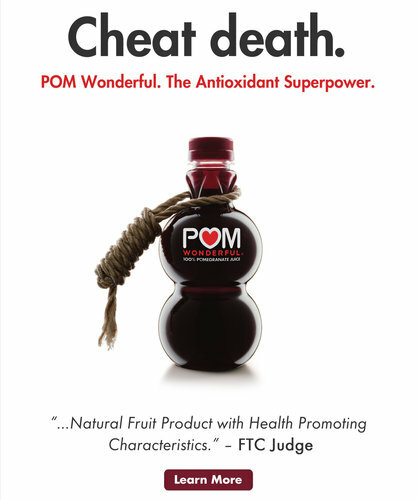 The FTC says POM has not proved that drinking its juice will cheat death. POM says it has spent $35 million on peer-reviewed research proving that the antioxidants in pomegranate products promote health. Of course they do. Antioxidants in all fruits and vegetables promote health. Maybe POM should resort to the defense used by Coca-Cola against charges that Vitamin Water makes deceptive health claims. Once again: health claims are about marketing, not health. Expect POM to take the FTC to court over this ruling. Stay tuned. The FTC’s latest report on food marketing to kids: glass half full or empty? Last Friday was a big day for releasing reports that federal agencies would rather keep quiet. As I discussed in my previous post, the FDA released its long overdue environmental impact report on GM Salmon. Today, let’s take a look at the FTC’s latest report on the state of food and beverage marketing aimed at children. This is a follow-up to the report the FTC issued in 2008. Total spending on food marketing to youth ages 2-17 dropped from $2.1 billion to $1.79 billion, mainly because of less spending on television advertising. But spending on new media, such as online, mobile, and viral marketing, increased by 50 percent. Cross-promotions that link marketed foods with popular children’s movies and TV characters increased from 80 children’s movies and TV shows to 120. Cereals had 0.9 gram less sugar and 1.6 grams more whole grain. Fast food was a little lower in calories, sodium, sugar, and saturated fat. Despite the commendable progress, this report identifies areas where further efforts could be made by the food and beverage industry and the media industry to improve the nutritional quality of foods marketed to youth. Whether you see this as good news or not such good news depends on whether you see the glass as half full or half empty. If you are a half-full type, you will rejoice that food companies are voluntarily improving the nutritional quality of their products even if the improvements are small. If you are a half-empty type (which, in this case, I am), you will be dismayed at the lack of real progress in reducing the marketing of junk foods to kids. Companies must sell more and more products to grow their businesses. They are under pressure to reduce such marketing and to improve the quality of the products they sell. Neither change is likely to increase sales. Hence: resistance to change. As Andy Bellatti points out, small nutritional improvements are unlikely to have much of an effect on health: reducing the sugars by 0.9 grams can be interpreted as “better for you” but does not necessarily make a product a good choice. And as Michele Simon’s interview with former marketer Bruce Bradley suggests, the data on which the FTC based its positive assessments may well have been gamed by the companies reporting it. As I read this report, it provides plenty of evidence that stopping food and beverage marketing to kids is the issue that matters most to doing something to reverse childhood obesity. The election is over. Maybe Let’s Move! can revisit the marketing-to-kids issue. Someone needs to do it. And soon. The Federal Trade Commission (FTC), which is responsible for regulating advertising, has just revised its “Green Guide” to eco-labeling. Explanations of specific attributes, even when true and substantiated, will not adequately qualify general environmental marketing claims if an advertisement’s context implies other deceptive claims. Marketers [are] not to imply that any specific benefit is significant if it is, in fact, negligible. If a qualified general claim conveys that a product is more environmentally beneficial overall because of the particular touted benefit, marketers should analyze trade-offs resulting from the benefit to substantiate this claim. The FTC did this, according to the New York Times, to reduce the confusion caused by the proliferation of eco-labels. In surveying consumers, the F.T.C. found that products that were promoted as “environmentally friendly” were perceived by consumers to have “specific and far-reaching” benefits, which, the government says, they often did not have. “Very few products, if any, have all the attributes consumers seem to perceive from such claims, making these claims nearly impossible to substantiate,” the commission said. No wonder the public is confused. The Consumer Reports Greener Choices index of eco-labels goes on for pages, and the international EcoLabel index currently lists 432 icons and programs. But the FTC guide says nothing about claims that a product is natural, organic, or sustainable. “Organic” is defined by the USDA through its National Organic Program. “Sustainable” has no regulatory definition. Will the FTC’s guide help alleviate confusion? Perhaps, if companies follow it. Q: I still don’t get it. Why would a city government think that a food regulation would promote health when any one of them is so easy to evade? A: Quick answer: because they work. As I explained in my July discussion of Richmond’s proposed soda tax, regulations make it easier for people to eat healthfully without having to think about it. They make the default choice the healthy choice. Most people choose the default, no matter what it is. Telling people cigarettes cause cancer hardly ever got anyone to stop. But regulations did. Taxing cigarettes, banning advertising, setting age limits for purchases, and restricting smoking in airplanes, workplaces, bars and restaurants made it easier for smokers to stop. Economists say, obesity and its consequences cost our society $190 billion annually in health care and lost productivity, so health officials increasingly want to find equally effective strategies to discourage people from over-consuming sugary drinks and fast food. Research backs up regulatory approaches. We know what makes us overeat: billions of dollars in advertising messages, food sold everywhere – in gas stations, vending machines, libraries and stores that sell clothing, books, office supplies, cosmetics and drugs – and huge portions of food at bargain prices. Research also shows what sells food to kids: cartoons, celebrities, commercials on their favorite television programs, and toys in Happy Meals. This kind of marketing induces kids to want the products, pester their parents for them, and throw tantrums if parents say no. Marketing makes kids think they are supposed to eat advertised foods, and so undermines parental authority. Public health officials look for ways to intervene, given their particular legislated mandates and authority. But much as they might like to, they can’t do much about marketing to children. Food and beverage companies invoke the First Amendment to protect their “right” to market junk foods to kids. They lobby Congress on this issue so effectively that they even managed to block the Federal Trade Commission‘s proposed nonbinding, voluntary nutrition standards for marketing food to kids. Short of marketing restrictions, city officials are trying other options. They pass laws to require menu labeling for fast food, ban trans fats, prohibit toys in fast-food kids’ meals and restrict junk foods sold in schools. They propose taxes on sodas and caps on soda sizes. Research demonstrating the value of regulatory approaches is now pouring in. Studies of the effects of menu labeling show that not everyone pays attention, but those who do are more likely to reduce their calorie purchases. Menu labels certainly change my behavior. Do I really want a 600-calorie breakfast muffin? Not today, thanks. New York City’s 2008 ban on use of hydrogenated oils containing trans fats means that New Yorkers get less trans fat with their fast food, even in low-income neighborhoods. Whether this reduction accounts for the recent decline in the city’s rates of heart disease remains to be demonstrated, but getting rid of trans fats certainly hasn’t hurt. Canadian researchers report that kids are three times more likely to choose healthier meals if those meals come with a toy and the regular ones do not. When it comes to kids’ food choices, the meal with the toy is invariably the default. A recent study in Pediatrics compared obesity rates in kids living in states with and without restrictions on the kinds of foods sold in schools. Guess what – the kids living in states where schools don’t sell junk food are not as overweight. Circulation has just published an American Heart Association review of “evidence-based population approaches” to improving diets. It concludes that evidence supports the value of intense media campaigns, on-site educational programs in stores, subsidies for fruits and vegetables, taxes, school gardens, worksite wellness programs and restrictions on marketing to children. The benefits of the approaches shown in these studies may appear small, but together they offer hope that current trends can be reversed. Researchers also suggest other approaches, not yet tried. The Yale Rudd Center has just shown that color-coded food labels (“traffic lights”) encourage healthier food choices. And Rand Corp. researchers propose initiatives like those that worked for alcoholic beverages: Limit the density of fast-food outlets, ban sales in places that are not food stores, insist that supermarkets put junk foods and sodas where they are hard to see, ban drive-through sales, restrict portion sizes and use warning labels. These regulatory approaches are worth trying. If research continues to demonstrate their value, cities will have even more reason to use them. If the research becomes compelling enough, the federal government might need to act. In the meantime, cities are leading the way, Richmond among them. Their initiatives are well worth trying, testing and supporting. POM Wonderful has a full-page ad in today’s New York Times (how much do these things cost?) titled “FTC v. POM: You be the judge.” The ad includes selected quotes from the judge’s decision (see yesterday’s post) and refers readers to its wonderfully named website, pomtruth.com, where you can see the quotes and the ads for yourself. I couldn’t help doing some checking. Competent and reliable scientific evidence supports the conclusion that the consumption of pomegranate juice and pomegranate extract supports prostate health, including by prolonging PSA doubling time in men with rising PSA after primary treatment for prostate cancer (page 282). The basic research, the Pantuck Study, and the Carducci Study, relied on by Respondents [POM Wonderful], support the conclusion that pomegranate juice has a beneficial effect on prostate health. However, the greater weight of the persuasive expert testimony shows that the evidence relied upon by Respondents is not adequate to substantiate claims that the POM Products treat, prevent, or reduce the risk of prostate cancer or that they are clinically proven to do do so. Indeed, the authors of the Pantuck Study and the Carducci study each testified that their study did not conclude that POM juice treats, prevents, or reduces the risk of prostate cancer. And, as Respondents’ expert conceded, no clinical studies, research and/or trials show definitely that the POM Products treat, prevent, or reduce the risk of prostate cancer. Competent and reliable scientific evidence shows that pomegranate juice provides a benefit to promoting erectile health and erectile function (page 198). There is insufficient competent and reliable scientific evidence to show that pomegranate juice prevents or reduces the risk of erectile dysfunction or has been clinically proven to do so…There is insufficient competent and reliable scientific evidence to show that pomegranate juice treats erectile dysfunction in a clinical sense or has been clinically proven to do so. Because these statements are attributed to the same expert witnesses, this must mean that while some studies show benefits, the experts do not believe that these studies (many of them sponsored by POM) are scientifically credible. Pomegranate juice is a juice. Fruit juices are healthy and especially delicious when fresh. I happen to like the taste of pomegranate juice. But does it have any special health benefits as compared to orange, grapefruit, grape, or any other fruit juice? Would any fruit juice be likely to prevent heart disease or prostate problems on its own? Despite POM’s out-of-context advertisement, the Administrative Law Judge did not think so, and neither do I. Addition: I’m indebted to FoodNavigator.com for noticing some of the other ads. I’ve been following the legal battles between the Federal Trade Commission (FTC) and the makers of POM juice and other pomegranate juice products with avid interest, mainly because they deal with the credibility of sponsored scientific research. The judge ruled that reasonable consumers would interpret the ads as making such claims but that the company had not produced convincing evidence to support them. The judge’s decision makes entertaining reading for someone like me who enjoys debates about whether sponsorship of scientific studies influences results and interpretation—as evidence shows they most definitely do. POM has invested more than $35 million in research to prove that pomegranate juice has health benefits. It has sponsored about 100 studies at 44 different institutions. At least 70 of these studies were published in peer-reviewed journals. It is not difficult to design research studies to give sponsors the answers they want and to make sure they are conducted well. POM is getting the best research that money can buy. One such study, of the effects of drinking pomegranate juice on myocardial perfusion (MP, blood flow to the heart), was conducted by Dr. Dean Ornish, who runs a preventive medicine institute in California (the quotes come from pages 268-269 of the decision). The Ornish MP study was originally designed to last 12 months, with measurements at baseline, 3 months, and 12 months. [The FTC] charges that the study was cut short when the three-month data came in favorably and Dr. Ornish faced cost overruns. Dr. [Frank] Sacks [expert witness for the FTC] opined that the shortened study period and failure to report the planned duration are inconsistent with widely accepted standards for conduct of clinical trials and undermine any confidence in the findings. Dr. Ornish testified that the Ornish MP Study was terminated after three months only because the Resnicks did not provide the funding that they had previously committed to this study…. [he said the study]constitutes credible and reliable science showing that pomegranate juice lessens the risk of cardiovascular problems. The judge found evidence on this study and many others conflicting. He ruled that this level of disagreement about the quality of the research means that the scientific evidence is not good enough to substantiate the claims. I was interviewed for a story in Business Week about this decision. This makes it clear why everyone should be suspicious of the results of sponsored studies…POM-sponsored studies produce results favorable to POM. POM’s owners have their own spin on the decision. It says the ALJ’s ruling affirms the scientific validity behind the general health benefits of pomegranates and “completely exonerates” POM regarding its claims in broadcast or print interviews. Let’s be clear what’s at stake here. According to the decision document, the owners of POM control 18,000 acres of pomegranate orchards. From September 2002 through November 2010, sales of POM juice alone totaled nearly $248 million (the supplements and other products add more). The owners must believe that nobody will buy pomegranate juice and supplements for any reason other than health benefits. Health claims are about marketing, not health. Let’s hope the FTC can make the decision stick.